I knew going into last night’s WOD that there would be deadlifts–I had seen a picture from earlier in the day and I was excited. The deadlifts looked heavy, which could mean only one thing–finding my 1 rep max for that sweet, sweet movement! The workout was that and a bunch more–it was CrossFit Total. This is the sum of the best of three attempts at the back squat, deadlift and shoulder press, done in that order. You warm up with the lefts before doing them, and when you attempt–you have three chances to meet or exceed your current 1 rep max of the lift. The last time I did the back squat was in October and I lifted 113lbs. This time, after warming up at 65 and 75lbs I knew I could get higher than 113lbs. So I did my first attempt at 115lbs. Nailed it. 125lbs, struggled, but I got up. loaded up another 10lbs and went for it. 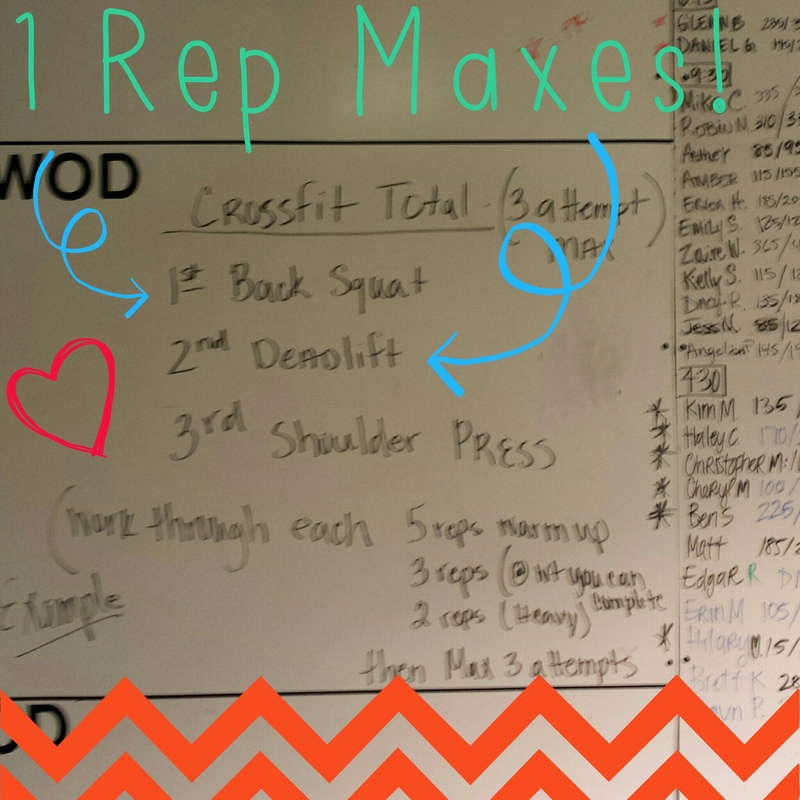 I might have grunted loudly as I came up, but I lifted 135lbs for my back squat and I had a new 1 rep max! WOO!! Shoulder press I knew was going to be a different beast, as I had been finding push presses to be more challenging lately. My previous weight was 93lbs. So Hayley and I set up the bar at 65lbs, and when I tried to do 3, it was hard. It was then that I knew–I was going to have a hard time pressing the same weight as last time. Sorry to say that I failed at 85lbs and thus my 1 rep max has dropped to 80lbs. To be fair, I did do those 21 thrusters Monday and about 70 push-ups Tuesday, so the muscles used for that lift could have been tired. Either way, I am not upset. When I looked at what the other women at my box were lifting for that movement, I was well above the average. All things considered, I am happy! I PR’d on two movements–by 15lbs and 37lb. I would say I am well on my way to becoming a seasoned crossfitter at this point–even with a foot injury. Way to go! Those are some pretty heavy weight you’re lifting there!